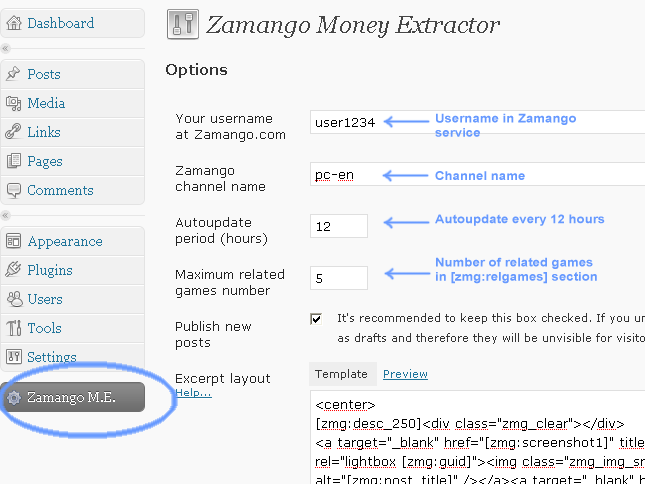 ﻿ Zamango Money Extractor plugin for WordPress at Zamango: earn cash with our content! What is Zamango Money Extractor? Zamango M.E. is a plugin which helps to earn money by affiliate sales of a various content from many sellers by means of a free service. Now the service offers only casual games, from the leading developers such as Reflexive, BigFishGames and Alawar for the English-speaking buyers, and Alawar and GameBoss (Nevosoft) for the Russian-speaking ones. Zamango M.E. plugin allows to use all possibilities of Zamango service for money making through the Internet completely simply having connected it to a popular free WordPress engine and having made some simple options. (1) It requires the installed Wordpress ver. 2.5 or later and the possibility to add plugins to it. It is important since there are many "blogs hostings" like blogg Zamango les. Zamango info or blog. Zamango com, which provide WordPress, but all of them forbid the installation of new plugins, that is why blog-hostings are not suitable for successful website initially. (2) It is necessary for you to be signed up on Zamango service. After you log in system you will be provided with all partners registration links (please sign up under the links from zamango.com, because they contain referal ID, which you will thank us for, we hope). The sign up process in all services is rapid and absolutely free. (3) Put your partner ID to Zamango reference panel. (4) Download the latest version of Zamango M.E. plugin and copy the archive content to /wp-content/plugins/ folder in your WordPress. (5) In the WordPress dashboard go to Zamango M.E. page (at the left below ). Fill in the username (o and the channel name on Zamango service. pc-pl - Polish for Windows. Also you can create other channels, for example, containing only English puzzles for Mac OS. Then adjust posts and excerpts appearance (hint: use the help and the Preview button) and press the "Syndicate now" button. Since there are many games in the base and time for script execution on server is limited, probably you will have to wait for some time before the appearance of the "Continue" button - you will have to press it until all games are imported. More detailed manual about Zamango M.E. plugin installation and usage can be found here.